But this is a bigger problem than many realize. A recent study by the Federal Reserve Bank of New York found that outstanding student loans have surpassed the nation’s $693-billion credit card balance. Even more eye-opening, nearly 80% of Americans held credit cards as of 2008, compared with 15% of consumers who now hold student debt. 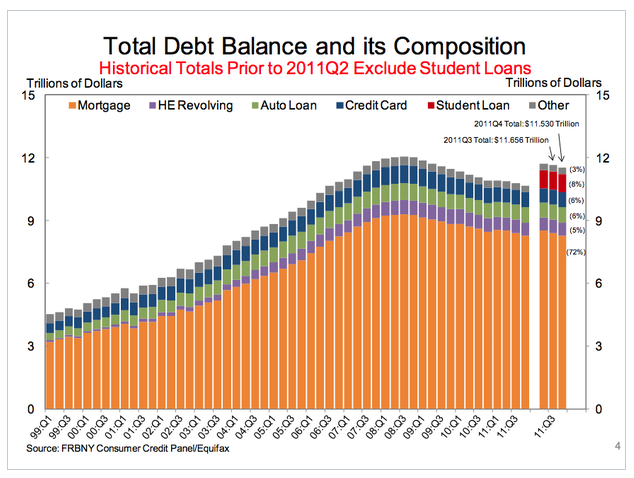 That illustrates just how small of a pool of Americans holds this huge pile of debt. Student Debt is non-revolving debt. It gets borrowed in a big chunk and paid off over years. Credit card debt is revolving debt — expanding and contracting on a monthly basis. If student debt is similar to anything, it is probably similar to other non-revolving debt, like mortgages and car loans. Student Debt has been rising, but the big reason it passed credit card debt recently is that credit card spending contracted massively during the recession. According to the article, student debt is a problem because of it’s scale. But when it’s revealed that it is only held by 15% of the population, that’s… more proof it’s huge? Supposedly the large amount combined with the small amount of holders shows something about how much debt the average loan holder owes. Except we already know how much the median holder owes — it’s around $13,000. Which is too high, sure, but also a directly citable figure that the article could provide. Would we see that as a good thing? Or would we look at that and wonder why people don’t spend money on things with tangible long-term benefits, instead of buying junk?